The critical reaction to Niki Caro’s film version of Diane Ackerman’s book of the same name has been what is usually termed as “mixed.” In other words, the reviews have been many and varied, ranging from the very enthusiastic to the downright dismissive. Can I add anything meaningful to what has already been said? Since the film did make a positive impression on me, I won’t be joining those who have been growling at the zookeepers, but I feel, nonetheless, that a few observations need to be made. The original book was based on the real diaries of Antonina Żabińska about how she and her husband Jan, wartime director of the Warsaw Zoo, saved the lives of 300 Jews in the Warsaw Ghetto. There is probably no point in enumerating the differences between the film and the book, because the filmmakers were clearly seeking to compress the various strands of Diane Ackerman’s retelling of the story into a dramatic whole, eliminating the odd character here and there and expanding on the entire Antonina/Lutz Heck relationship for purposes of creating tension. But could it possibly be, judging by the reactions of some reviewers, that the main problem with the film’s depiction of a courageous rescuer is that film-goers have difficulty accepting heroes or heroines who are too perfect? Are we somehow more prepared to relate to a character who is flawed, whose motives may be questionable, whose actions are not always honourable, and yet who ultimately does the right thing and therefore whose character is more interesting from a dramatic point of view? I’m thinking here, of course, of screen protagonists such as Steven Spielberg’s Oskar Schindler or Agnieszka Holland’s Leopold Socha. A virtually perfect person, on the other hand, whose motives are entirely pure, seems to be beyond the realms of the experience of many of us, particularly as film-goers who have become rather used to flawed protagonists. Since someone like Antonina Żabińska did not seem to have had any faults, or at least very few, then she – or her character as portrayed in Jessica Chastain’s committed performance – has been categorized as being somehow unreal. But Żabińska was a real person who simply did what she felt was right. If her character is not the stuff of dramatic tension, then she cannot be blamed. From the point of view of attracting an audience, if a filmmaker had to choose between creating a film about two rescuers, one whose extraordinary affinity with all living creatures – whether it be animals or humans – prompts her to risk her life and that of her family in order to save threatened Jews, or another, such as Matylda Getter, associate of the more famous Irena Sendler, who rescued hundreds of Jewish children from the Ghetto but whose simple motivation was Christian charity and who was a Franciscan nun, the likelihood is that fewer people would relate to a saintly, supposedly unworldly, nun than to a working wife and mother. But Getter, the modest nun who did what she saw as her Christian duty, was not a million miles removed from Żabińska, whose motivation may not necessarily have been religious, but who was certainly humanitarian and, judging by her memoir, involved something quite primal, a sense of connection with nature and all living beings. The film’s inclusion of zoo animals has also prompted accusations that this somehow overshadows or trivializes the horrendous tragedy at the story’s centre. The film is not terrifying enough for some, who claim that the subject is sanitized, but, on the other hand, it is too terrifying for others, since some commentators have also questioned the film’s rating – (PG-13 in the US and 12A in the UK) – which makes the violence and killing accessible to impressionable youngsters. Since the story is told from Żabińska’s viewpoint, it has to be accepted that her world revolved around animals. She was an author who wrote children’s books about animals and seemed, if her memoir is any guide to her personality, to be a genuinely good, caring, and essentially uncomplicated person. It is clear that mistreatment of any living being was an affront to her sense of right and wrong. The fact that the Diane Ackerman book is so popular tends to confirm that many people share or otherwise relate to Żabińska’s worldview. Her memoirs, however, demonstrate that she was well aware of the political situation and was not so naïve that she did not recognize the dangers to which her principled stand exposed her family, which makes her courage all the more remarkable. Indeed, Ackerman notes that both she and her husband carried cyanide pills at all times. In terms of the style of the film itself, there is always the matter of how to handle a topic as overwhelmingly horrifying as the attempted annihilation of an entire people without falling into the trap of not doing justice to, or even trivializing, the subject. Is the black-and-white sombre documentary style of a Schindler’s List necessarily more realistic or more respectful than the apparent gaudiness of parrots or tigers in glowing colour? Is it fair to accuse the Zookeepers filmmakers of giving prewar Warsaw and the world of the zoo an exaggerated radiance in order to contrast it with what happened on the first day of September of 1939? Żabińska’s seemingly carefree existence in the halcyon days of the summer before the war has even prompted a rather uncharitable comparison to a heroine out of a Disney film. But many Poles who survived that horrendous time, as evidenced in memoirs and reminiscences, point up the contrast between a lost idyll which was shattered forever by the Nazi onslaught and the nightmare years which followed. The technical question, raised by some reviewers, about employing an accented English by a character who would have been speaking Polish anyway is a legitimate one and could provide the subject matter for a lengthy disquisition in its own right. Meryl Streep’s character in Sophie’s Choice, for example, would certainly have spoken English with a Polish accent, but why give a foreign accent to a character who is speaking her own language in the first place? The answer might be that this is a theatrical convention, a kind of shortcut, which an audience readily accepts for the sake of recognizing that the protagonists, who, although they are speaking English for the purposes of being understood, are not actually English or American (or other native English speakers). People like Quentin Tarantino have challenged this convention, of course, and separate essays could be written about the subject. In terms of the film’s acting in general, it needs to be said that all in the cast were impressive and, as already mentioned, Jessica Chastain’s commitment to the role was particularly notable. The film’s focus is primarily on the barbaric treatment of the Jews of the Ghetto. On this point, some reviewers have questioned the way the Jewish characters are presented, criticising the apparent anonymity of the individuals featured in the story. The Ackerman book has more to say about sculptor Magdalena Gross, for instance, or people such as Maurycy Fraenkel or the entomologist Dr Szymon Tenenbaum. Naturally, because the main protagonists here are the rescuers, the focus is on them. But even if the story had been told from the point of view of one of the people in hiding, and who we know survived as a result, it would never have been quite as moving as the point of view of another famous person in hiding during the war, the teenage Anne Frank. Her diary about her everyday life describes a largely unremarkable existence similar to that of the zookeepers’ “guests”. What makes her written thoughts so poignant, of course, is the knowledge that we are reading the words of someone who, unlike the people in hiding at the Warsaw villa, did not survive. Since there seemed to have been hardly any Polish input into this film in terms of advisers – (some Polish reviewers have asked “why didn’t we make this film ourselves?”) – and although the substitution of Prague for undamaged pre-war Warsaw was perfectly understandable, perhaps more significant than the question of Polish accents is the depiction of the Polish Christian or otherwise non-Jewish population itself. There may be some justification in the claim by one or two reviewers that the film almost entirely overlooks the treatment by the German occupiers of the non-Jewish Warsaw population. Although Jan mentions in the film that a non-Jewish Pole might be shot for offering a Jew a drink of water, that is virtually the only allusion to the danger facing Christian Poles themselves, regardless of whether or not they helped Jews. Being Christian or, at any rate, not Jewish, was not in itself a guarantee for surviving the war in Poland. Although some opportunists or Nazi sympathizers undoubtedly accommodated themselves to the German occupation, nevertheless between 1939 and the outbreak of the Uprising in 1944, most citizens – (those who remained in the city and had not been forced into exile) – were concerned with somehow surviving, despite being routinely terrorized. Right at the beginning of the occupation there were arrests and mass executions of the leading political figures and intelligentsia (for example, the Palmiry Forest Massacre), and subsequently there were random street roundups (łapanki) in which citizens were caught up and sent either to concentration camps or as slave labour onto the territory of the Reich. There were also executions in reprisal for attacks on the occupiers. The book and memoir make abundantly clear that the zookeepers themselves were treated in a marginally more privileged fashion than ordinary Warsaw residents, precisely because of their zoo and because of the fact that they enjoyed the dubious protection of their pre-war acquaintance, Lutz Heck. This is, of course, at the very heart of the story. Although we learn that Jan is taken prisoner after the failed ’44 Uprising, the fact that Poles were being shot and imprisoned from the war’s beginning does not really register in the film. A reference to this might have provided some background to the actual events of 1944. It has been noted that, regardless of whether the ’44 Uprising was strategically or militarily justifiable, one of the reasons given as to why it was inevitable was the popular desire to avenge the years of brutal occupation. All the above points aside, it has to be said that most Polish reviews of the film have nevertheless been positive, perhaps unsurprisingly, since there have not been all that many Western films which have presented non-Jewish Poles in a generally favourable light. The previous observation immediately leads on to the subject of Polish anti-Semitism, real or imputed, a trope so common nowadays that almost any random online discussion on just about any historical Polish subject will sooner or later feature a below-the-line commentator throwing the usual damaging accusation or stereotype into the thread. One or two western reviewers have remarked that Polish anti-Semitism is not featured, or at least soft-pedalled in the film. Given the recent upsurge of European ultra-nationalism and xenophobia, and since certain vocal elements in Poland provide no exception to this apparent trend, this may not be such an unreasonable claim. Personally, I think the film does attempt to allude to anti-Jewish attitudes on the part of some Poles. There is a short scene, for instance, virtually a tableau, which includes a couple of callous Warsaw citizens taking photographs of themselves in front of the Ghetto gates. This is presumably meant to hint at the allegedly uncaring attitude of a section of Warsaw gentiles at the time. This brief scene is something which is not featured in the Ackerman book, but perhaps is meant to be an equivalent of the notorious carousel which appeared outside of the Ghetto during its destruction, and which Ackerman does mention. Whether setting up the carousel was a deliberate Nazi propaganda ploy and to what extent the Nazis built on anti-Jewish attitudes already existing among some in the Polish population are questions which have been debated by historians. The controversies surrounding the infamous carousel are discussed (in Polish) in this article by Tomasz Szarota. There is little doubt that there were extremists and chauvinists in Polish society who needed little encouragement from the Nazis to turn on their Jewish fellow citizens. However, some hitherto impartial but credulous people were persuaded to withhold any sympathy for the Ghetto insurgents after the announcement by the Germans of the discovery in April 1943 of the Katyń graves. The cynical Nazi publicity machine exploited the murders, predictably claiming that the notorious NKVD massacre was “Jewish-led”, a part of the overall “Jewish-Bolshevik conspiracy”. (How many people knew at the time, or even know now, that the Katyń victims included hundreds of Jewish officers, the chief Rabbi of the Polish Army, Baruch Steinberg, among them, a fact which certainly would not have suited the strategy of the Nazi propagandists?) It is surely no coincidence that the timing of the announcement on the 13th April 1943 of the German discovery of the graves immediately preceded their assault on the Ghetto on the 19th. Once the “pacification” began, the likeliest scenario is that the average Warsaw resident simply looked on in helpless horror. On the whole, since people have criticized the film for not focusing enough on Polish Christians or not focusing enough on Polish Jews, then the filmmakers probably got the balance just about right. The subject itself is bound to elicit emotional responses from anyone who has the slightest connection with the events depicted. For the theoretically objective viewer for whom the entire subject of the war is an unknown, this film may serve as an introduction to others which offer different, arguably much more challenging treatments. The famous Spielberg film about Oskar Schindler has become a kind of benchmark in mainstream cinematic depictions of the Holocaust, perhaps partly because the essentially positive story focuses on those who were saved as opposed to those millions who did not survive, but also perhaps because it is filmed in a realistic documentary style, featuring monochrome photography designed to give an authentic, period feel. The cinematic bar may well have been raised by a more recent work. Audiences may not be quite as ready, however, to sit through the sustained horror of a film as utterly nightmarish and harrowing as Hungarian director László Nemes’s award-winning Son of Saul, an unflinching indictment of Nazi savagery which tells the story of what happened to those who did not find a saviour like Schindler or Jan and Antonina. This stunning and powerful depiction of the inferno of a death camp demonstrates, incidentally, that the question of whether a film about the Holocaust should be in colour or black and white is completely irrelevant – it is ultimately the on-screen events themselves which matter. No doubt screenwriter Angela Workman and director Niki Caro’s secondary aim was to explore the relationship between humans and animals, in which case the clear and depressing conclusion is that our supposedly superior species has often been responsible for far more cruelty and savagery than any wild beasts. But despite the film’s occasionally overly sentimental scene, the story of Antonina Żabińska demonstrates that humans can also be genuinely kindhearted, good, and noble. Most of us may think we share these qualities, but what really transforms some exceptional individuals into heroes or heroines, of course, is precisely their courage in not abandoning their humanitarian values and principles when placed in the most severe and testing conditions. 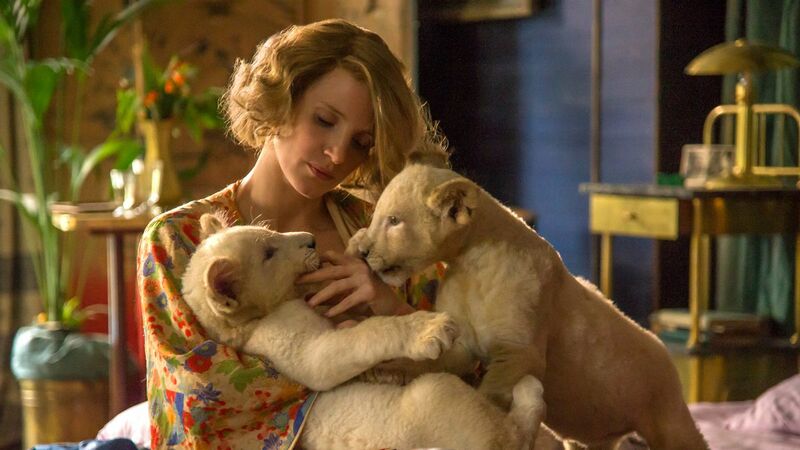 It’s difficult to say if The Zookeeper’s Wife will become any kind of classic on the subject of the wartime persecution of the Jews, particularly when one compares it to the others mentioned, but for all of the reservations which critics have expressed about it, it is a well-intentioned film which honours a remarkably brave woman and her equally brave husband, It also goes some way to shine a light on the ordeal of the citizens of Warsaw during the 1944 Uprising, which is not all that well-known in the West. 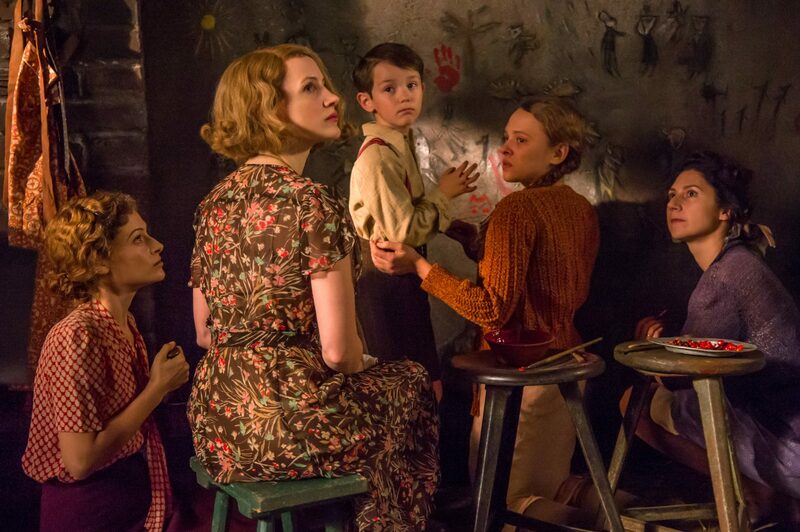 The Zookeeper’s Wife is specifically a tribute to the spirit of Polish (both Jewish and non-Jewish, Catholic and atheist and any other) resistance to the tyranny imposed by Hitler’s Third Reich on Warsaw and the country in general in the name of a perverse ideological quest for racial purity. On a universal level it is also a prayer for sanity and the civilized values of charity, empathy, and humanity in any time which finds itself threatened to be ruled by mass insanity, hatred, and barbarism. Lessons derived from this darkest period of recent history can never be untimely. Thank you very much for your thoughtful essay on our film. I’d like to take this opportunity to mention that many elements some critics found missing in the film were in the screenplay, which was developed with fully realized Jewish characters, as well as non-Jewish Poles, and which included more detail from the book. These were cut for time. Sometimes, because of budget or contractual obligations, it becomes necessary to focus a film story to the extent that one simply cannot include every facet, especially in a historical rendering like this, with its enormous scope. There was much more we would have liked to explore. The filmmaking craft is as much about streamlining as anything. That demand can be as painful for the filmmakers as for the audience. The intent, then, is to capture the heart of the experience as best we can, within the constraints of time and budget. Your points are well made and very much appreciated. It was good of you to write this. Thank you again. Thanks for your review, a very good coverage of the film, its’ faults and positives. I saw it here in Perth one month ago and thought it good but not great. As you point out, for one thing, it did not show the terrors endured by Christian Varsovians on the streets in this period. It should have been made by Poles which is always the case for WW2 type stories of this type based in Poland. I speak with some knowledge here, my father was from Warsaw, in the AK , captured in 1943 and survived Pawiak plus 2 concentration camps including Auschwitz Birkenau. Thanks again. Best regards.